I rarely use boxed cake mixes but my Aunt Dora has been really working me over for a year to make this cake..She says everyone that eats it loves it..I have put off making this cake for too long and figured today was the day to make auntie happy. .It reminded me of German chocolate cake(a lot easier though) from yester year...I followed her recipe and at the very end wasn't sure I was doing the final step correctly but it worked out and the finished product was better than I had expected. Delicious! If you like coconut and pecans you'll love this!!! Don't know what they call it Earthquake? I guess I'll have to ask her the next time I talk with her. .Happy Baking! Note: I guess using a box cake isn't so bad now and again! My mom should hear me say that! Any baking I did with her would be from scratch!! I used a tablespoon to spoon cream cheese mixture over batter. Preheat oven to 350 degrees. Sprinkle coconut, pecans and white chips evenly in the bottom of a lightly greased 13 x9 inch pan. Mix cake mix according to directions and pour into pan.. In a medium bowl, thoroughly blend cream cheese, butter, powdered sugar and vanilla..Drop by spoonfuls onto cake mixture..Do not stir. Bake 40 to 45 minutes until toothpick inserted in center comes out clean..Cool completely before serving.. Slice in pieces and turn piece over so coconut/pecan mixture is on top.. A very easy and delicious choice for a dessert. Happy Baking from my kitchen to yours! Thanks for commenting..Wow earthquakes on a regular basis..yikes!! !Be safe! When you make the cake and cut it, turn over so the good stuff is on the top.. Subscribe to receive my daily posts on a regular basis. I would be delighted to have you follow me! The number of Awesome people who have visited I Like to Bake and Cook! 2016 I Like to Bake and Cook. Awesome Inc. theme. Powered by Blogger. Impossible Coconut Custard Pie! Delish!! Custard Rice Pudding! Three times a charm!! Strawberry/ Blueberry Cobbler like Mom would make! 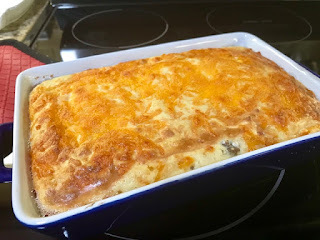 Easy Pierogi Lasagna Casserole: Busy families will love this! !